After Hurricane, Texas School Tries To Meet Demand For Construction Workers : NPR Ed A new construction training center is opening in Houston just weeks after flooding from Hurricane Harvey ravaged homes around the city. Students are learning skills that are in high demand. Eric Arjon practices on a circuit board at Lone Star College's new construction trades center in Houston. He is training to become a heating, ventilation and air conditioning technician. More than a month after Hurricane Harvey and historic flooding ravaged south Texas, a new construction training center is opening in Houston — and the timing couldn't be better. 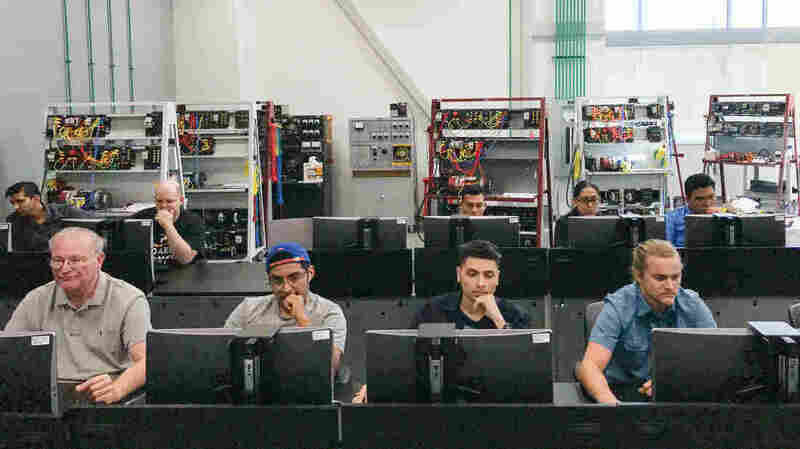 "It was just sort of a matter of weird circumstances," says Linda Head, associate vice chancellor of workforce education at Lone Star College. The public community college system is set to formally open its long-planned Construction and Skilled Trades Technology Center on Oct. 30. 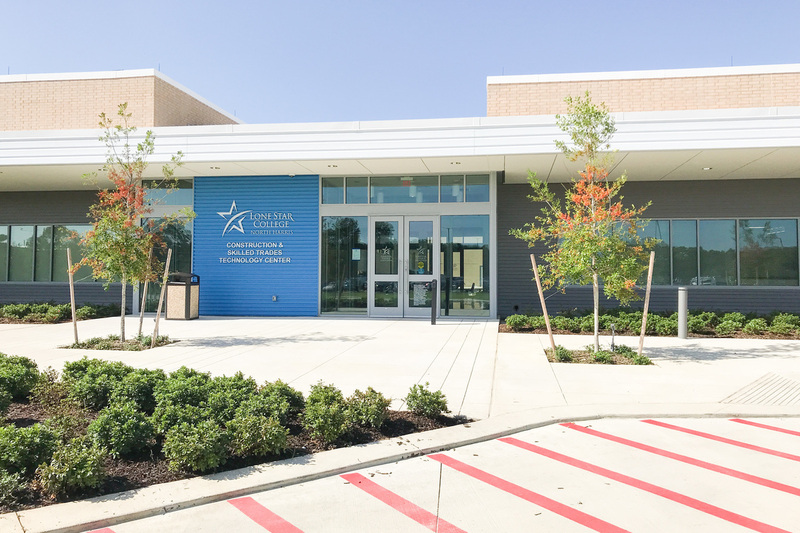 Lone Star College's Construction and Skilled Trades Technology Center is set to formally open on Oct. 30. Part of the college's campus near the Bush Intercontinental Airport was used as an emergency shelter after Hurricane Harvey. 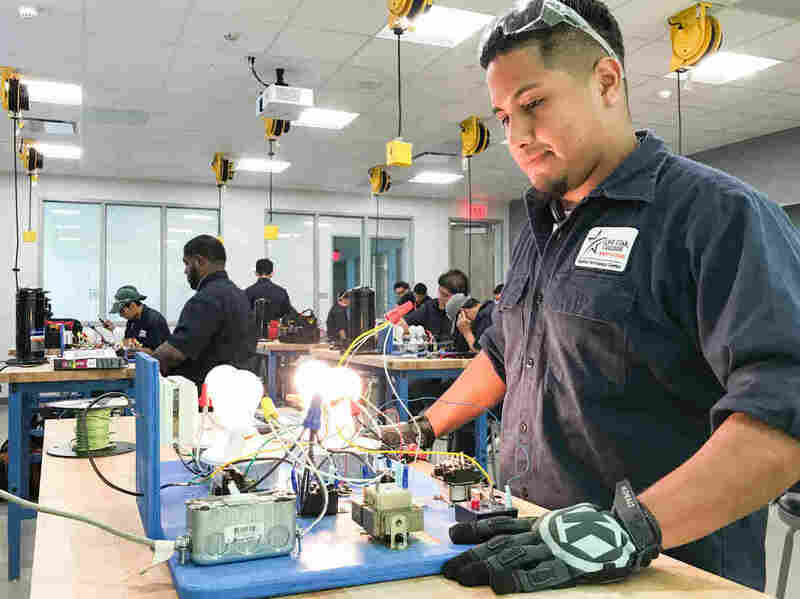 Located near Houston's George Bush Intercontinental Airport, the center was originally intended to train more workers for industrial construction projects in the Houston area. Harvey's destruction and the emerging recovery efforts — estimated by Texas Gov. Greg Abbott to cost more than $150 billion — have expanded the need for more workers to rebuild homes and commercial properties, too. "We had not offered things like drywall taping and floating, roofing, flooring. But we have to do it," says Head, who adds that Lone Star College was already adapting its curriculum for residential projects before the storm hit. Randy Williams, a former Lone Star College student who now teaches in the HVAC department, says employers have tried to hire his students before they finish their training. About 800 students are enrolled in the construction trades program. Besides earning an associate's degree, students can enroll in certificate programs to get a jump start on jobs in pipefitting, welding, or heating, ventilation and air conditioning (HVAC). 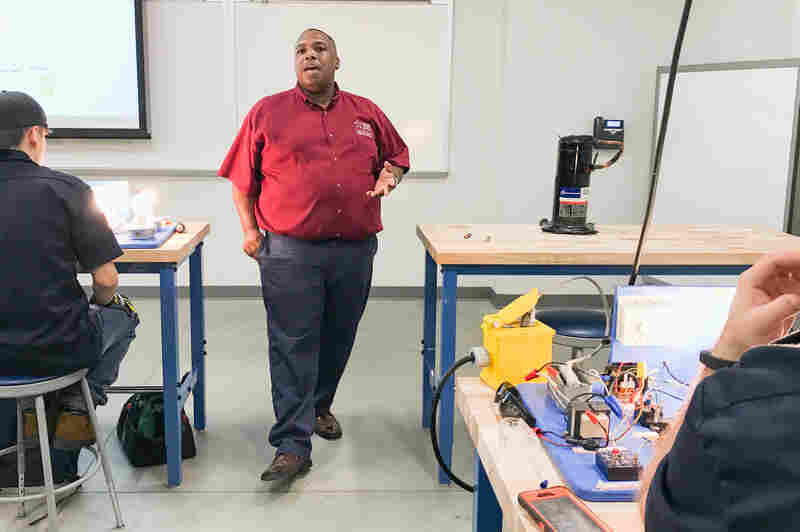 Finding a job after graduation here is not a problem, says Randy Williams, a former Lone Star College student who now teaches in the HVAC department. In fact, companies have tried to hire his students before they finished their training. "We're actually slapping the hands of our employers," he says. "We try to let them know that these students have to graduate first before they can get them into their employment." Students work inside one of Lone Star College's new electrical technology training labs in Houston. Nationwide, 70 percent of contractors say they're struggling to find qualified construction workers, according to a recent survey by the Associated General Contractors of America. Texas has been facing similar hiring challenges, which could drag out the time it takes to rebuild after Harvey. But those challenges are also an opportunity for Lone Star College and its students, like 23-year-old Eric Arjon. The floodwaters after Harvey swamped his pickup truck and mobile home. After the storm passed, he constantly checked for updates on when his classes to become an HVAC technician would finally begin. "I want to be able to help the people that were affected," says Arjon, who started attending classes a month ago and is set to finish his program next year. "I want to be a blessing to people."